1944 – Born on the 27th of October in Ghent (Belgium). 1972 – Exhibits her drawings and paintings at the Kunstcentrum Amsterdam. 1973 – Exhibits her drawings and paintings at Castle Herteveld (The Netherlands). 1974 – Exhibits her drawings at the Raadhuiszolder in Weesp (The Netherlands). 1974 – Embarks on a brief career as art critic for the newspaper “De Nieuwe Weesper”. 1974 – Studies engraving at the classes of Lex Metz at the Amsterdam Rietveld Academy. 1975 – Marries artist and photographer René Stoeltie. 1975 – Becomes a member of “De Onafhankelijken” (The Independents) and exhibits her drawings in the Stedelijk Museum in Amsterdam . 1976 – Exhibits her drawings at the Galerie van Wisselingh(Amsterdam). 1978 – Exhibits her paintings at the Galerie Alexandra Monett in Brussels. 1980 – Opens an art, antiques and design gallery in Brussels. 1984 – Exhibits her drawings of fantastic animals at the Galerie 21 in Geneva. From 1984 till this day, Barbara collaborates- with René as a photographer- on the production of articles for art, design and lifestyle magazines and books. 1957 – Born on the 5th of June in Arnhem, The Netherlands. 1958 – The family moves to Amsterdam. 1968 – Studies graphic design at the Grafische School in Amsterdam. 1975 – Marries the artist and art critic Barbara Laforce. in Amsterdam. 1975 – Exhibits his paintings and drawings at the Raadhuis in Weesp, The Netherlands. 1979 – Moves to Brussels. 1979 – Exhibition of his paintings at the Galerie J.J van Eyll in Brussels. 1980 – Opens an art and design gallery at the Galeries Royales Saint Hubert in Brussels and promotes the work of Dutch designers Rob Eckhardt, Peter Sas et Aldo van de Nieuwelaar. November 1983 – “Décoration Internationale” publishes an article on his work and home. 1984 – Publication in the Dutch magazine “Avenue”. 1985 – Moves to Amsterdam. 1987 – The legendary Min Hogg, chief editor of the English magazine “The World of Interiors” (Condé Nast) asks him to produce articles on art and design for her magazine with Barbara as the author. From 1988 on, he publishes his photographs in a great number of prominent magazines with Barbara as the author. They publish their productions in The World of Interiors, Harper’s Bazaar, Elle, Ambiente, Casa Vogue, House & Garden, Architectural Digest, Mezonin, Homes and Gardens, Madame, Country Homes and Interiors, Architektur und Wohnen, Maison Française, Country, Seasons, Abitare, Casa da Abitare, La Mia Casa, La Maison de Marie Claire, Résidence, Avenue, Eigen Huis & Interieur, Veranda, House Beautiful, Colonial Homes, Metropolitan Homes, Victoria, Antiquariato, Casa Y Jardim, Hide&Chic, MoreThenClassic, VrijNederland, Miljonair, ClassicHomes, ColonialHomes, Maison, Henne, Mad&Bolig etc. 1992 – Stays in Prague for one year and moves to London. 1992 – Collaborates on the Laura Ashley catalogue. 1995 – Works from London, Paris and a Georgian manor house Ireland and his permanent home in a 17th century castle in the heart of The Netherlands. 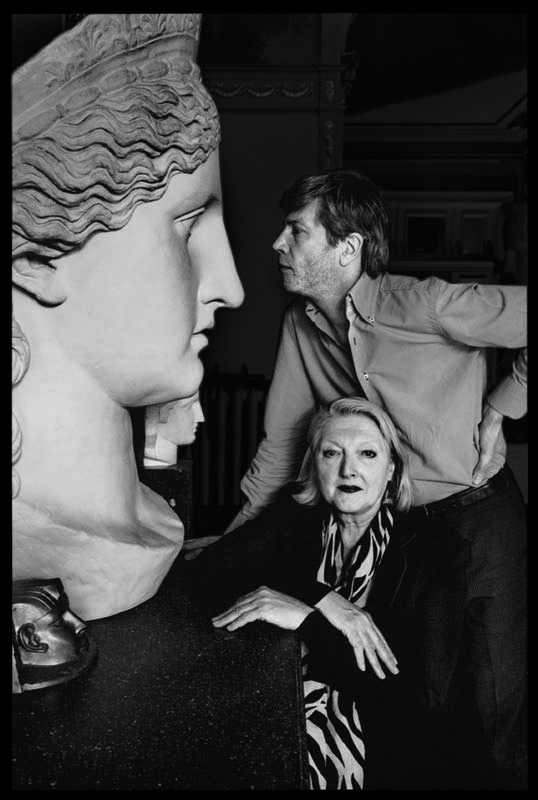 1997 – Exhibits his photographs of fragments of neo-classical statuary under the theme “Les Statues Vivantes” at the Galerie Patrick Fourtin in Paris. 1998 – Exhibits “Close–Up” at the Galerie Parade à Amsterdam. 1998 – Photographs the advertising campaign for champagne Pommery. 1999 – Exhibits “Interiors” at the Centrum voor Kunst en Architektuur in Haarlem (The Netherlands). 2002 – Exhibition of his “Visions of Christ” at the Convent de la Missio in Palma de Mallorca. 2003 – Exhibition of his “Visions of Christ” at the Galerie Mortier–Valat in Paris. 2004 – Exhibition of his “Visions of Christ” at the Galerie Jean-Jaques Hervy in Brussels. 2006 – Exhibits his photographs of the empty Manoir de Lèves, home of the late interior Madeleine Castaing (1894-1992) at the Galerie Mortier-Valat in Paris and produces a catalogue entitled “Adieu Lèves” to accompany the exhibition. 2007 – Collaborates with American photographers Christopher Flach and Aaron Hawks (Beekman Films) on a documentary about the life and times of Madeleine Castaing. 2008 – With Barbara as a stylist and author, he publishes a book on the art of Belgian paper artist Isabelle de Borchgrave entitled “Rêves de Papier”/Paper Illusions, a co-édition with the Fonds Mercator (Belgium), Editions La Martinière (France) and Harry N.Abrams (USA). Foreword by Hubert de Givenchy. 2008 – Publishes “ART !”, a compilation of 20 years of encounters with artists, collectors, gallery owners, museum directors and his close friendships with the widows of René Magritte and Man Ray. The book is published by the Fonds Mercator and Les Editions de La Martinière. Foreword by Jean-Louis Froment. 2009 – Creates and publishes the first volume of a series of books entitled “La Magie des villes”, starting with “La Magie de Marrakech”, published by the Fonds Mercator, Les Editions La Martinière and Thames and Hudson with a text and styling by Barbara and a foreword by French philosopher Bernard-Henri Lévy. 2010 – From March 18 till the 2nd of May, he exhibits his large “diasec” photographs at the Galerie Kelman-Visser in Brussels. 2010 – he publishes the second volume of his “La Magie des Villes” series, “La Magie de Paris” with a foreword by French interior designer Jacques Garcia. The book is published by the Fonds Mercator and Flammarion/Rizzoli. 2011 – the Fonds Mercator and Flammarion/Rizzoli published the third volume in the series , “La Magie de New York” – “New York Interiors, bold, elegant, refined” with a foreword by Kenneth Jay Lane. 2011 – Taschen publish a new version of “Living in Morocco”, “Living in Greece” and “Living in Mexico”. 2013 – Flammarion published, “Intérieurs – De Louis XV à Andrée Putman” and the english version “The Art of the Interior: Timeless Designs by the Master Decorators”. DVA published the german version of the book “Die Kunst der Inneneinrichtung”. 2013 – René and Barbara opened The Gemini Art Gallery in Le Sablon in Brussels. 2014 – the fourth volume of “La Magie des Villes” series, “La Magie de Londres” is published by the Fonds Mercator. 2015 – A book about designer Maroeska Metz is published by Louvre Victoire. 2016 – Louvre Victoire published a book “Une saison a Tanger” with the text of Barbara Stoeltie, Andrée Putman, Jean-Paul Einthoven and Bernard Henri-Levy. 2017 – Taschen added Living in Morocco to his Bibliotheca Universalis. This is an extended version of the book of 2011. 2018 – The Gemini Art Gallery moved to Latem-Saint-Martin in Flanders.